Congratulations, you have excellent taste. Here are some stealth pics to give you a hint at the growing collection of artist collaborations we've been working on with some of the west coast's baddest artists. Hit us up for more info if you're interested! Hey fans, we're looking forward to the arrival of another production run of lighted turntable sculptures just in time for the holidays! Better than a messy x-mas tree, our lighted wall sculptures are made by hand, glow with LED awesomeness, and last all year long. Get your festive on by ordering one for yourself today! The first live production run encountered some unexpected delay but is finally shipping to anxiously awaiting customers tomorrow. Photos below were taken right before packing a few sets into shipping boxes. If you missed out on this run, don't worry. Now's the perfect time to contact us to place your order for the next batch! Folks, here are some pics from the fabricator of the next production run of our turntable light sculptures. Finished products should start shipping between mid Dec and early Jan. Looking good! Friend, art enthusiast, and time traveller* "Digs" publishes a blog, 52 North, about design, photography, fashion, and modern urban culture. We love his sense of style, humor, and ever-growing collection of eye candy - 52 North is your source for international inspiration & visual stimulation, offering momentary glimpses of the world as seen through the eyes, ears, and mind of Digs. Get your digs on by following 52 North! *52 North recently relocated from Oregon to Amsterdam, which is 9 hours ahead of PST. Ha! Wood+Light has partnered with Peace & Love Thru Music to auction off one of our lighted turntable sculptures, with proceeds to benefit the Playing For Change Foundation, Guitars in the Classroom, Resounding Joy, and Kids for Peace. 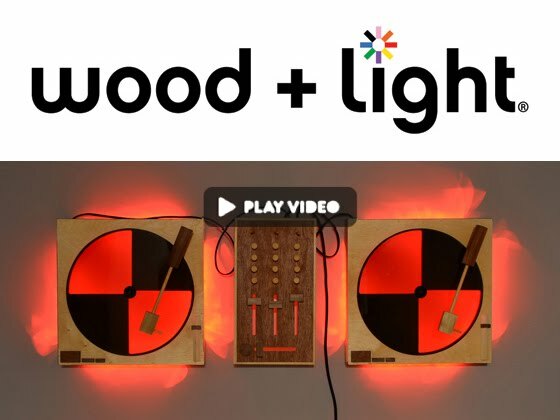 The Playing For Change Foundation is a friend of Wood+Light. They're dedicated to connecting the world through music by providing resources to musicians and their communities around the world. We're thrilled to be able to support this wonderful program through the upcoming charity auction! Prototypes on display around LA! Folks, check out our News page for a list of recent media coverage, together with screen shots and links to the online articles. And while you're there, please take a minute to like/tweet/share the article with your friends. Thanks! I'll be installing a few prototype sculptures in strategic venues around Los Angeles over the next week, so Nanda just whipped up this sweet business card design to help folks find us online after they fall in love with the demo displays in person. The two of us make such a great team! Word up! Send us a tweet @woodpluslight and follow us for updates on new design releases, sales, and related news.